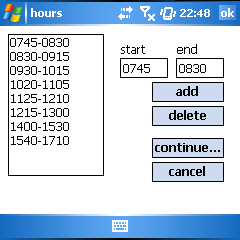 This freeware indicates a student or pupil on base of their schedule (time-table), which lesson she/he has at the moment and where she/he has to go next. Therewith senseless running around in the school or the university building is supposed to be diminished. 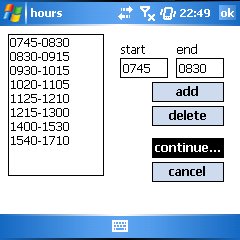 The application was developed for devices with the .net-framework from Microsoft for PocketPCs. The profile will be saved into a file with the extension ".unt". To work properly Help! obviously needs some data of the timetable at the beginning. After that a dialogue for inputting/changing of the hours will appear. because following changes can lead to problems since the lessons are not shifted, but rather assigned to the first, second,... hour. 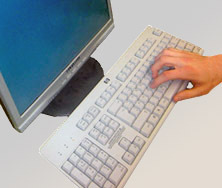 If this was successfully done, you can go on with the input of the lessons by clicking on "continue...". Notice: By clicking on "cancel" you can leave every dialog without changes. ... you can go on with the lessons of every day. 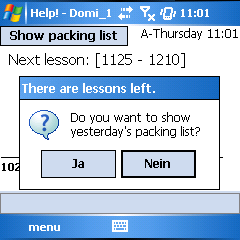 In the following dialogs you can associate lessons/rooms to the previously input times. a) enter lesson / room and confirm with "change"
Notice: In order for Help! 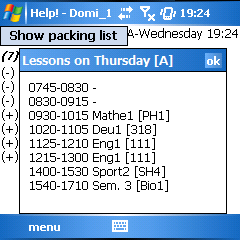 to be able to generate a meaningful packing list, every lesson has to be named in exactly the same way at all days! After entering all information for this day, you can confirm the dialog with "ok" and continue with another day. The programm Help! can handle two-week periods. A-weeks are straight and B-weeks are odd weeks. 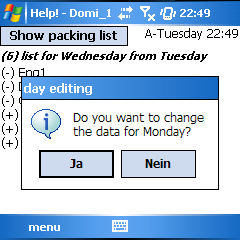 The current week (A or B) is shown at the top right edge of the main screen and in the dialog "lessons"-> button "2 week" in the caption of the appearing message. In order to input two-week periods, please add "_A_" or "_B_" (without quots) before the specialty (lesson) name. notice 1: Please do not use empty signs before or after the | separator! by clicking on "Sym"->at the place, where else 0 is located. tip: You can view this part (entry of two-week period) in the dialog "lessons" by clicking on "2 week". 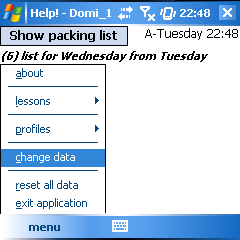 To show the packing list during lessons, the button "Show packing list" (top left edge) can be used. # If school hasn't yet started (time before the first hour), a message appears that yesterday's packing list (for today) will be shown. # If school has already started, Help! asks you whether to show yesterday's packing list or the one for the following day. 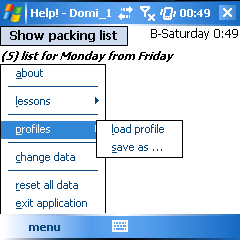 # After school the packing list will be shown in a seperate window when clicking on "Show packing" list.